The world ain't all sunshine and rainbows. It's a very mean and nasty place... and I don´t care how tough you are, it will beat you to your knees and keep you there permanently, if you let it. You, me or nobody, is gonna hit as hard as life. But ain't about how hard you hit... It's about how hard you can get hit, and keep moving forward... how much you can take, and keep moving forward. That´s how winning is done. So the question comes to mind, how to be so HAPPY? How to be so SUCCESSFUL in life? Answer is: Naked I came from my mother's womb and naked I will depart. Only what I do echoes in eternity. Right, one fine day you will die leaving behind - all the money you earned, all the people you loved, all the people you hurt. You came alone, you will go alone. After that day few people will remember you, some will cherish your memories while some will still be angry with you. How would you like people to react after your death? I assume, most of you would like people to remember you by the good things you did to them. Each time they will remember you, a bright smile would come right under their nose and they would say - 'He/She was so amazing/funny/kind'. So in short, life is a journey. You can either sit back, relax and enjoy the ride or keeping on crying, blaming, cursing and be miserable. Life is always about choices you make. Understand that, most certainly you will not get all of the 3 components. Some of us are too wealthy and loved by all but they suffer by cancer. Some of us found their love and are healthy but they do not have money. While some of us are healthy and wealthy but still finding love. Interestingly, all these 3 components will always be felt less and we will keep expecting more and more. Unless, you are sitting idle. Yes, the moment you sit idle, the moment you do not have anything to do, you tend to think. Think about what you do not have. Scientifically, it is proved that it is very easy to be sad than to be happy. So the hobbies, passion, ambitions, aims play a very significant part in your lives. People who do not have goals in life tend to think - think how miserable their lives are. Although in reality their lives are much more better than others. They are fortunate to take little things in life for granted e.g. safe drinking water, two meals a day etc. While other people who have aims, goals in life tend to be achievers. And the whole world loves achievers. Achievers tend to be successful because they have a reason to get up in the morning, pursue their dreams and they become happy by doing what they are doing because that is what they want. So, get up and find out what you want - you always wanted to get physically fit? you always wanted to be rich? you always wanted to be loved by your friends and family? Work on what you want. Work on your goals. You have to stretch yourself to achieve something and that is the success mantra. Everyday you have to be a better person than you were yesterday. 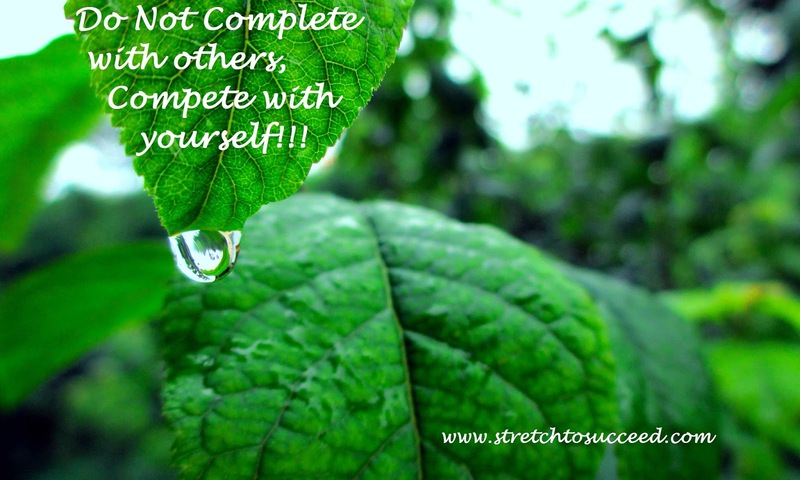 Do not compete with others, compete with yourself. Click to read top 100 inspirational stories. Click to read cherry picked 500 inspirational quotes. Click to read what world famous 500 people had to say about life and success. Click to see list of must watch inspirational movies. Click to watch motivational videos. Click to see list of must read inspirational books.